TSPSC Pharmacists Answer key, Results 2018 at tspsc.gov.in: TSPSC Pharmacist Grafe II Posts Recruitment Hall tickets 2018, TSPSC Pharmacist Posts Recruitment Exam date 2018, Pharmacist Posts in Director of Public Health and Family Welfare, DME and TVVP, TSPSC MPHA Posts Recruitment, TSPSC Pharmacist Posts Recruiment : Telangana State Public Service Commission (TSPSC), Hyderabad issued TSPSCPharmacist posts Recruitment 2018 Notification (Advt. No. 04/2018 ) for the recruitment of Pharmacist posts in Telangana Vaidya Vidhana Parishad (TVVP), Telangana State. Eligible candidates can apply online through tspsc.gov.in from 29.01.2018 to 28.02.2018. HALL TICKETS: (TSPSC Pharmacist Posts Recruitment 2018 Hall tickets) Hall tickets can be downloaded 7 days before commencement of Examination. 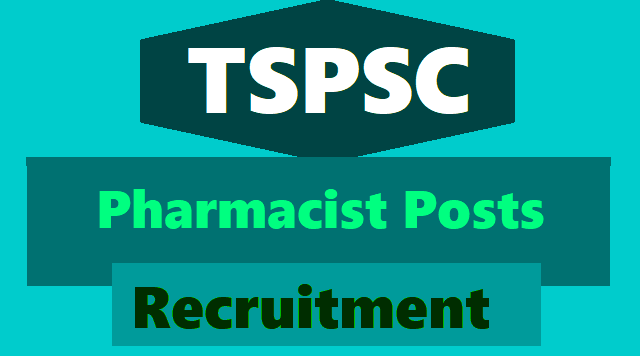 TSPSC Recruitment for 238 Pharmacist Vacancy: - Telangana State Public Service Commission (TSPSC) has released its notification for recruitment of 238 Pharmacist. If you want to make a career with the TSPSC Recruitment, then this is your chance. Apply for this TSPSC Recruitment and make the most of this opportunity. The last date to apply for this TSPSC Vacancy is 28 February 2018. Read the article to know in detail about the salary, pay scale, total vacancies, important dates and Here are some of the important Highlights of the TSPSC Recruitment Notification 2017. Last date: 28 February 2018. Salary: Rs. 21230 -63010 per month. Application fee for TSPSC Recruitment:- Rs 200 towards online application processing fee and Rs 80 towards examination fees to be paid by online. Selection Process for TSPSC Recruitment: - Selection will be based on Computer Based Test or OMR Written Test (Objective Type).